Lil Diner is a amazing product! Every household should own 20! Fortunately enough if you only have one kid you only need 1, if you have 2 kids you only need 2 ..so on..and so on.. Lil diner will save your household and your stress! If you have a kiddo that thinks dinner time is play or finger paint time you need Lil Diner in your life! Messes happen but messes happen less frequent with . Lil Diner. 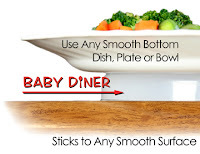 Keep babys food from the plate to their mouths and not the floor, the walls, them, and you! Lil Diner is made of all plastic, so there will be no breaking, chipping or cracks. Saftey first! the base is harder semi clear pastic, the red part is a hard piece of plastic that connects the base to the 3 suction cups which the suction cups stick to the table, So no matter how hard your kiddo pulls, tugs, pushes, or hits the Lil Diner it won't budge a inch! Lil diner is light weight so you it's perfect for your purse, diaper bag, or at home in a drawer. 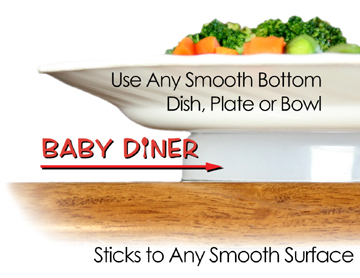 Lil diner would make a perfect give for friends,family, a co worker, babyshower and much more! You can buy your own Lil Diner Here. They also have other amazing products such as plate saver, Cup Holder Attachment, and more HERE. ♥ I receive no monetary compensation for this review. I was provided a Lil Diner to try and give my honest opinion.